Last night I attended a Microsoft preview event held in New York City. On display amongst the numerous PCs, Zunes, Hardware and other goodies were some upcoming Xbox 360 titles. The first title I immediately was drawn to was Halo 3: ODST, in which a Microsoft rep was knee deep in a replay of the four player co-op Firefight mode. 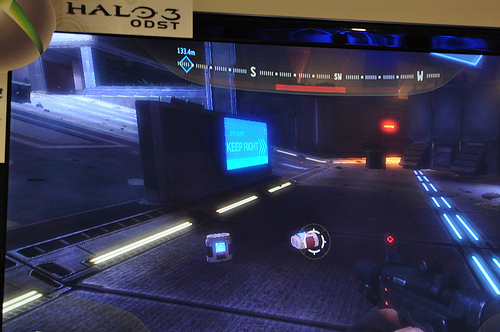 Halo 3:ODST puts players in the role of various Orbital Drop Shock Troopers. These squads are the front lines, dropped into battle from space to soften up the landing zones for the rest of the marines. The campaign opens after the main character is dropped into battle and knocked unconscious by some event. As you progress through the story you'll find artifacts and clues that help piece the puzzle back together. Each clue you pick up triggers a playable flashback in another ODST's shoes. The flashback I saw had to do as you stumbled upon a blown up bridge. Soon you discover a remote detonator, and then the flashback begins. While the main part of the game is a bit more slow and deliberate, the flashbacks are going to be those really intense Halo battles we've all come to know and love. 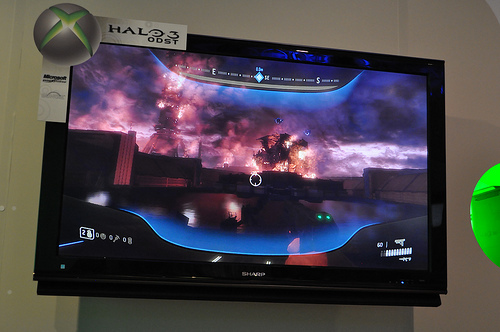 This particular flashback had put the player in charge of setting charges on a bridge as the Covenant assaulted it. It's an interesting way to tell a story, and it's one that's actually open ended. The game world is non linear, though players will be guided by the City AI. You'll see various clues in the signs and lights of the city hinting a direction to go, warning you of upcoming danger, or telling you to turn around. The other big addition to the UI is going to be the visor. Enemies are now highlighted in red, weapons and ammo in yellow, and other important objects are made to stand out in the environment. There's also a night vision mode - no more flashlight! But I needed to know - with all the talk of Firefight as a co-op mode - had the campaign lost cooperative play as well? Something that has been a staple of the series since the first title on Xbox. "There's absolutely co-op throughout the campaign." the Rep Confirmed. The rep couldn't confirm the number of players available, and whether or not the split screen with online option would be availalble - but with ODST running on the Halo 3 engine we're confident we'll see something similar to it. 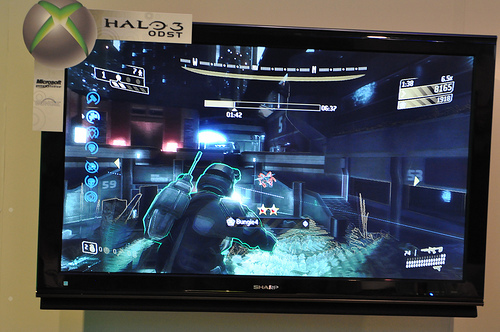 Since there was only on Xbox running ODST Microsoft couldn't show off the firefight mode, except for a saved replay. It looks pretty interesting, and a bit hectic. I especially like how there's a "base of operations" where you can run to, to rearm. Here's a short clip of it in action. Halo 3: ODST is looking to shape up to be a complete package for Halo and Co-Op fans. An entire co-op campaign, a brand new co-op Firefight mode, all the Halo 3 multiplayer maps, and a brand new Halo story? Sounds like a full featured title to me. Page created in 0.4812 seconds.